A few years ago, Que (a division of Pearson Publishing) reached out to me about writing a book on Social Media ROI (Return On Investment). Early on in the project, it became clear to me that the book needed to be about more than ROI. Before we could even talk about measuring anything, the conversation we all needed to have had to be about how all the pieces fit. If we understood that, then we could focus on driving the right outcomes, and if we could do that, then we could focus on measuring the right things. There needed to be structure, some cohesive framework that connected business objectives to digital and social activities (and campaigns). In order to be super clear to everyone in digital, the ROI bit had to be built into that. We couldn’t really have a productive conversation about ROI in digital and social without first laying out the basics. Block. By. Block. That’s what Social Media ROI ended up being about: building, managing and measuring social for businesses, big and small. The book became a sort of desk reference for everyone who works in digital PR, digital marketing, and digital customer service, and a textbook for students looking to pursue careers in the magical digital communication arts. That was both good and bad: I wrote it so it would be easy to understand, but it was thick, and a little more academic than the average “social media 101” -type book that were all the rage at the time. It wasn’t necessarily a light read. It also wasn’t short. Friends and peers asked me if I would ever write a shorter version of it – something a little more “pocket.” It wasn’t a bad idea, but at first, I didn’t really know what that would look like. Fast-forward a couple of years, to where my good friend and frequent co-conspirator Daniel Newman approaches me about writing a book together. 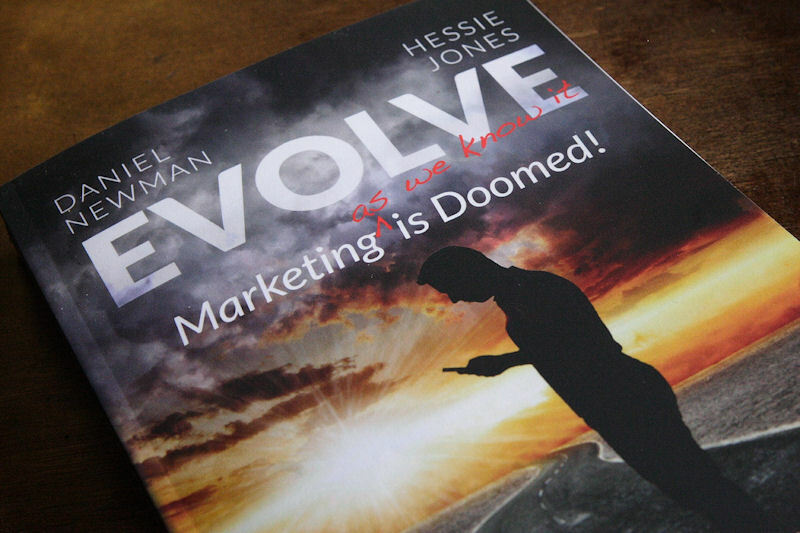 I can’t recall exactly when we first started putting pen to paper in terms of ideas and topics, but it probably started with my single-chapter contribution to Evolve. (I really did try to keep it short, but I am pretty sure that my guest chapter was the longest in the book.) By the way, if you haven’t read it yet, be sure to pick up a copy. It is packed with great advice and insights. It had to be shorter, leaner, full of tactical know-how, actionable tips and case studies. It needed to focus on helping readers actually get things done and avoid common mistakes. 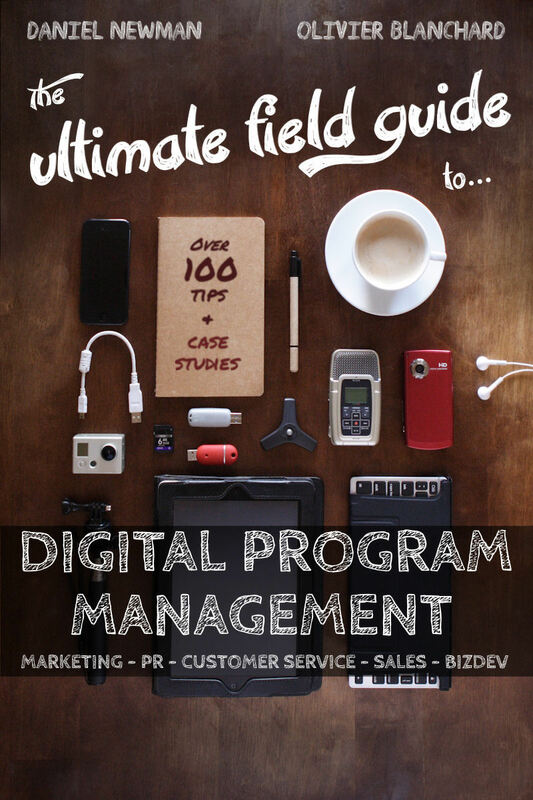 We wanted to help digital managers build their programs faster and get results quicker. We even squeezed in over 100 tips and about a dozen snapshots of case studies for readers to sink their teeth into. And the best part: it works whether you are an enterprise business or an SMB. B2B or B2C? It doesn’t matter. Even if you are working with a bare-bones budget and spending most of your time bouncing around airports, this field guide is for you. In fact… if you travel a lot, and your digital office fits inside your carry-on, this book is definitely for you (which was the idea behind the cover). If you haven’t already grabbed a copy, go ahead and fix that by clicking here. If you want to help improve business through your digital programs, also pick up a copy of the MBA-worthy Social Media ROI – Managing and Measuring Social Media Efforts in your Organization: The #1 Social Business desk reference for executives and digital managers. Congrats Olivier (and Daniel). Cover looks great. And, along with everything else you publish, I look forward to reading it.